I am taking a mini holiday in Chiang Mai for four days. 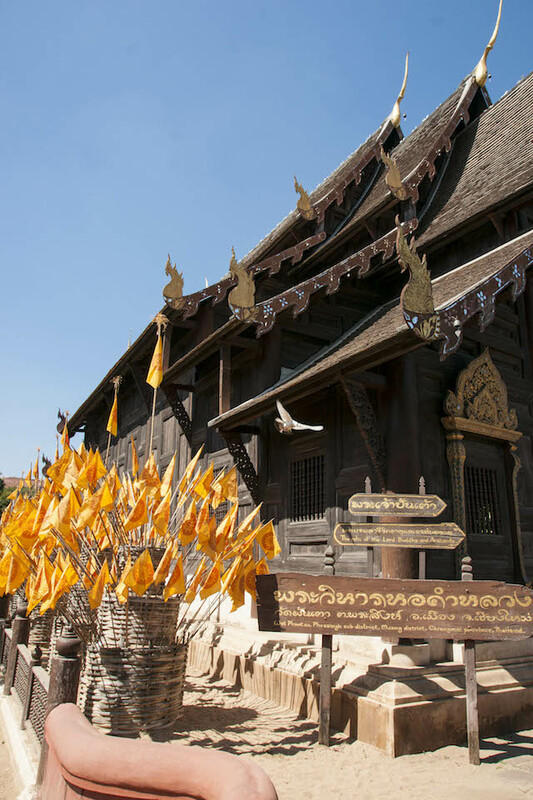 (In case you haven’t heard of Chiang Mai, it is a culturally and historically interesting city in Northern Thailand. It is surrounded by mountains and lush countryside) I have been here a couple of times before, but didn’t have a chance to explore much. This time I am quite excited to experience this lovely in depth a little bit more. This trip is quite last-minute, I didn’t have time to equip myself with any information i.e. where to eat, what to do (I usually prefer to plan things in advance). Fortunately, I have a friend who used to live in Ching Mai so I asked for her advice just a day before my trip, actually during my trip as well. So here is my itinerary I would like to share with you. After checking in, I went straight out for a walk at a local market, then took a red Song Taew ( a pick up truck that converted to carry passenger ) or what local people call รถแดง Rot Daeng to one of the Night Bazaars. 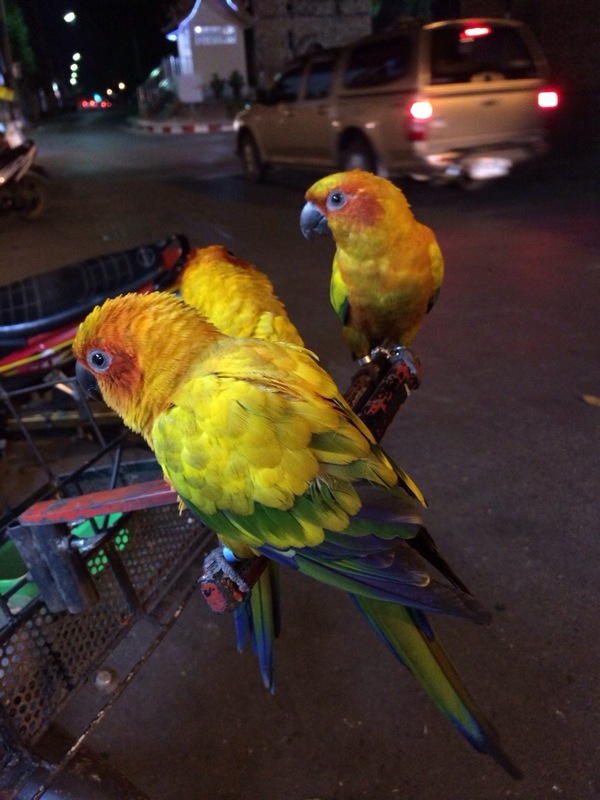 Spotted these three little cute parrrots at a Chiang Mai’s food market. 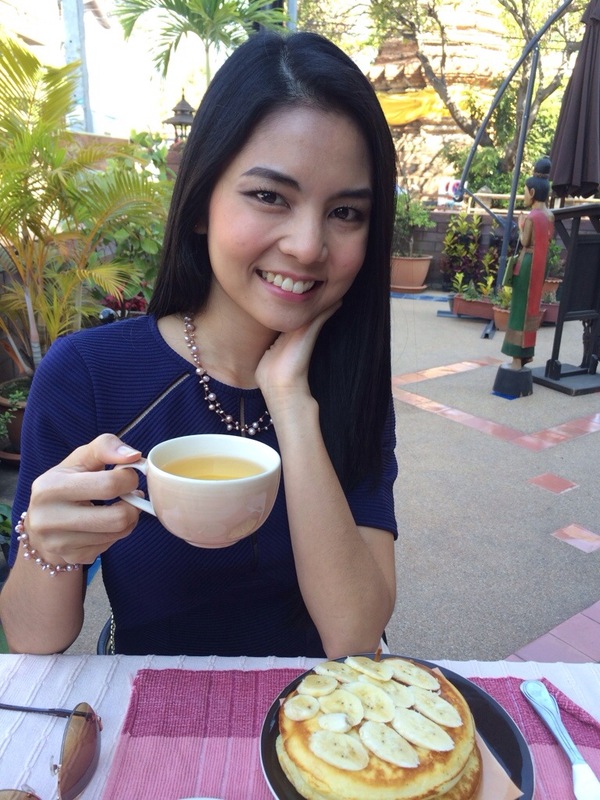 I had a nice breakfast at a cafe called Cafe de Thaan Aoan on Prapokklao Road (I followed good reviews on the internet). They offer both Thai and western breakfast. The staff are lovely, the service fast and the breakfast were yummy. It is also a good spot to watch people go by. I had Banaa Pancake, scramble egg and a taost with green tea. Aroi! Chiang Mai is overflowing with ancient Buddhist Temples (วัด wát) since Chiang Mai was founded over 700 years ago and successive Kings left their own mark on the city by building temples. There are over 300 temples!! so you might want to pare down your choices to the main attractions. After my energy tank has been filled, I headed to one of the most temples in Chiang Mai which is in the walking distance from the cafe; วัดพระสิงห์วรมหาวิหาร Wat Phra Singh Woramahaviharn. It was built in the 14th century to house the ashes of King Kham Fu, father of King Phayu, the fifth king of the Mangrai dynasty (ราชวงศ์เม็งราย). 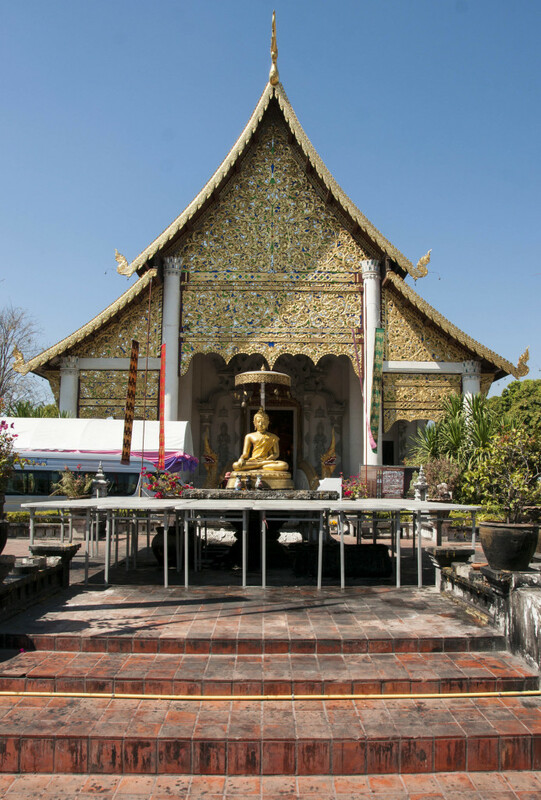 it is one of the biggest temples in Chiang Mai and one of the most visited. The temple houses an important Buddha statue: พระพุทธสิหิงค์ the Phra Buddha Sihing, the important Buddha statue for local people, which gives the temple its name. 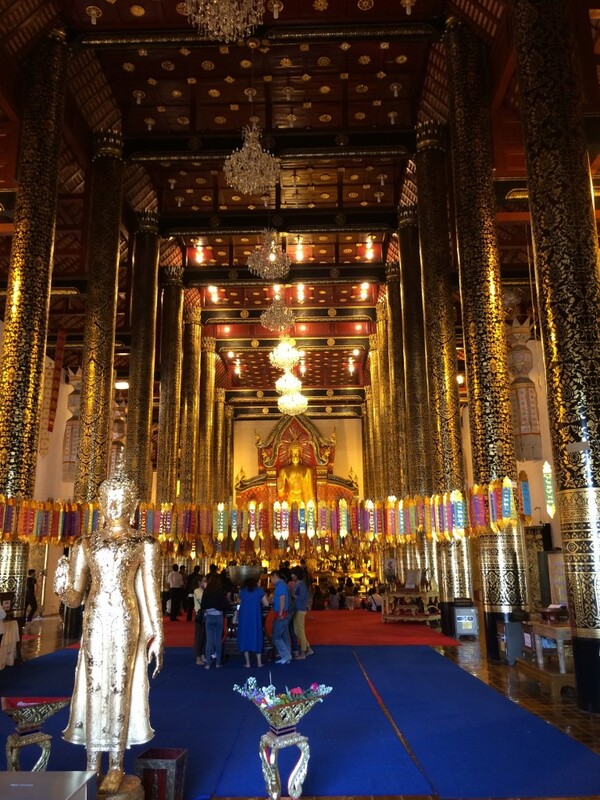 Inside the temple is very beautiful, and visitors can donate 100 Baht and get a flag of their birth year in Chinese sodiac which is believed to enhance your life. Inside Wat Phra Singh Woramahaviharn, very beautiful. My friend recommended me to visit วัดพันเตา Wat Pan Tao situated right next door to Wat Phra Singh Woramahaviharn. The name of this temple means “to increase 1,000 times.” The temple’s most interesting feature is its wooden wiharn (วิหาร), a chapel for lay people to pray in. The teak building was moved to the temple grounds in 1875 by King Inthawichayanon. It was formerly a royal residence, but the practice in Lanna was for each new king to built a new palace. The old palaces were often ‘recycled’ into other uses, especially in temples. 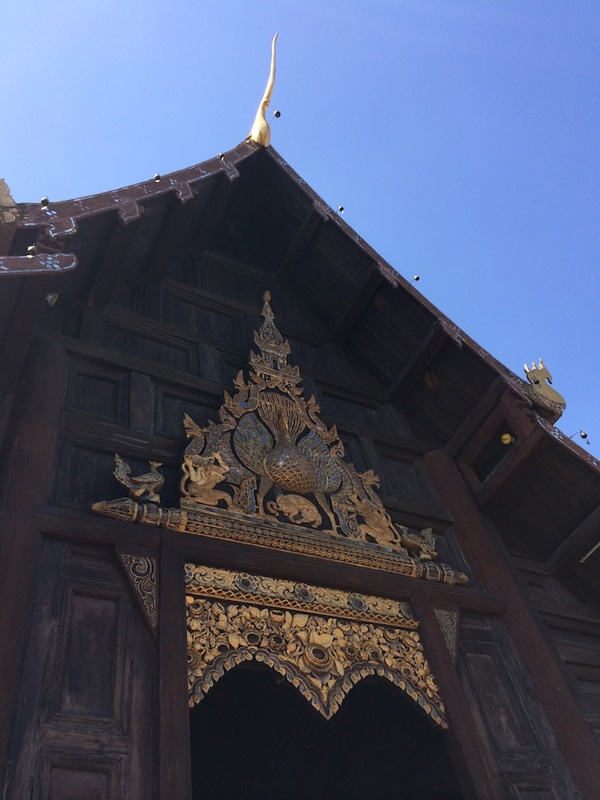 My favourite feature of this temple is a large gilded wood carving depicting a peacock flanked by several other animals, some of which are mythical over the main entry door. The peacock was the symbol of the kings of Chiang Mai; this carving has appeared on stamps and other materials celebrating Chiang Mai’s 700th anniversary. Peacock over the main entry door. Behind the teak Wihaan is “วัดเจดีย์หลวง Wat Chedi Luang”. It is an old pagoda dating back over 600 years old, and with several later additions stood some 90 meters tall. It was reduced to around 60 meters in height when the upper section fell as a result of an earthquake in the 16th century. This is my favourite pagoda in Thailand so far, it is so amazing and beautiful. One thing I knew I had to do in Chiang Mai is to taste some real Northern flavour, so after visiting the two temples which was around 1 p.m. I walked to a restaurant not far from Wat Chedi Luang recommended by my friend called Huen Phen, located on Rachamankha Road in the south-western quadrant of the old city. The interior of the restaurant is packed with antiques and bric-a-brac, mostly Thai antiques. The restaurant was packed with both tourists and local, luckily a table left so I got a seat. I ordered the must-try dish when you are in Chiang Mai ไส้อั่ว sai oua, the Northern Thai pork sausage flavoured with kaffir lime leaves, lemongrass, galangal root, red curry paste and turmeric. It is usually only moderately spicy. I think the herbal flavour of the sausage is distinct and enjoyable. 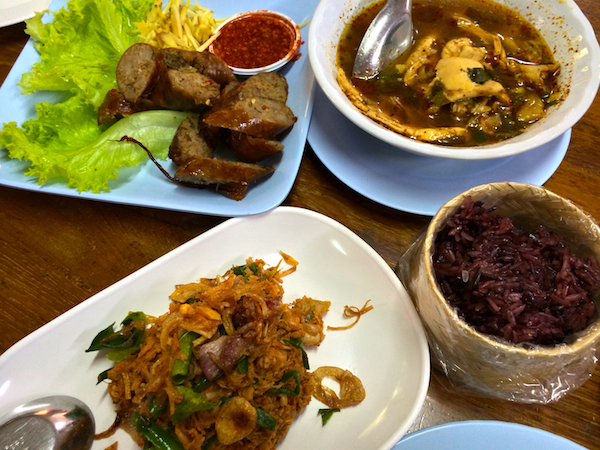 My first lunch in Chiang Mai. I loved that they served brown sticky rice – yummy and healthy! Kru Mod, if you have time go to the Tiger Kingdom and if you dare get photo with big Tiger! 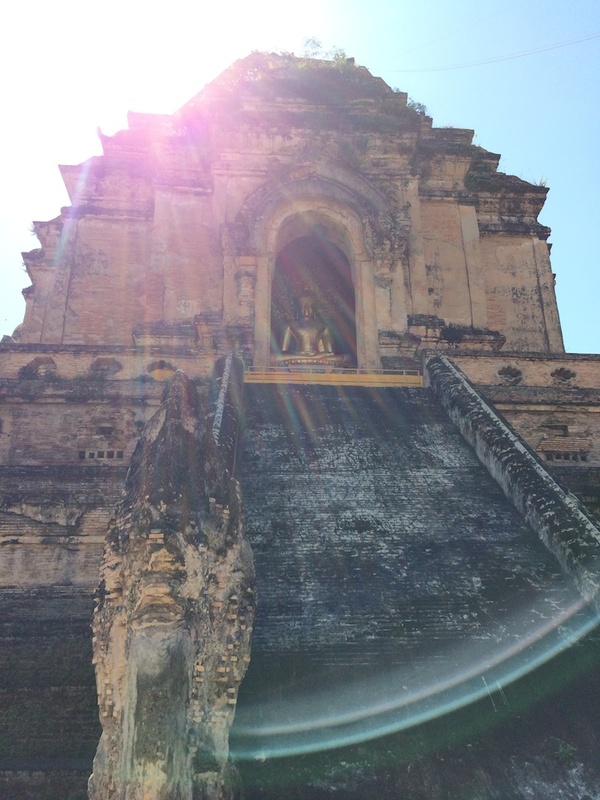 I was there in January and have some great photos to remember Chiang Mai. Food and coffee in the old city was great too. ห้ามไป night bazaar มันไม่ดีมาก! เชียงใหม่มีหลายตลาดดีกว่ามาก! 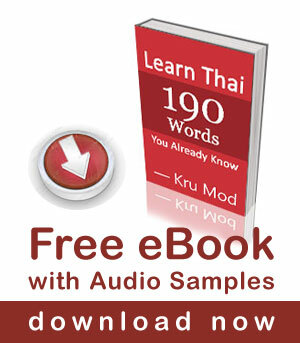 ตัวอย่างถนนคนเดินวันเสาร์และวันอาทิตย์ครัค …. I recommend to see Mae Sa Orchid Farm, the flowers are amazing and they have some beautiful jewellery too. Also, there are some other attractions in the same area. Another “must see” is Wat Phrathat Doi Suthep. What an amazing temple! 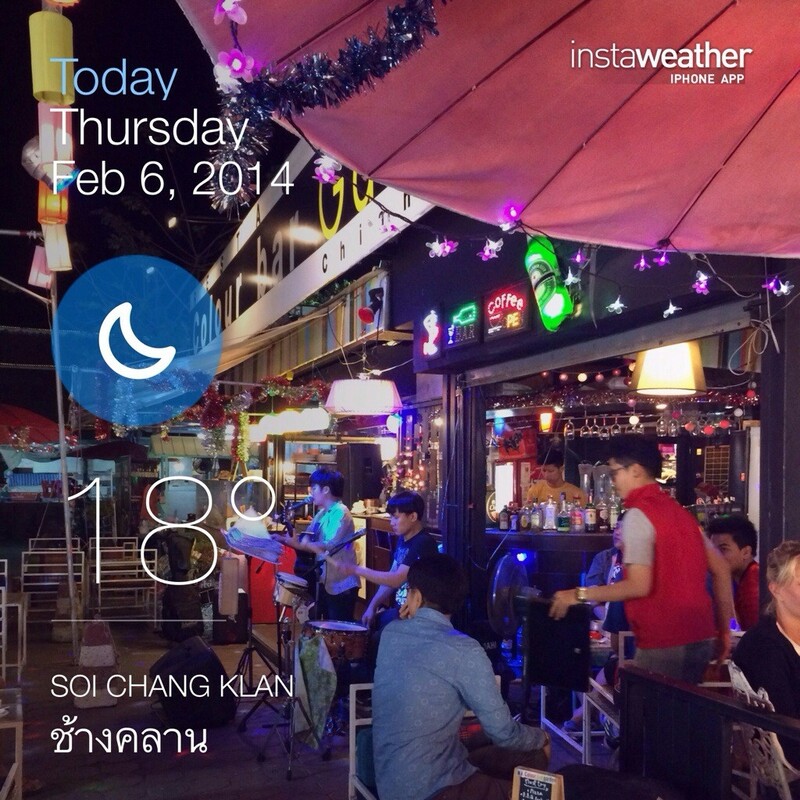 Have fun kru Mod, Chiang Mai is a beautiful city. Saturday is the Flower festival parade and it will also be a street festival with food and shopping . I think Nimmanhaemin Rd would suit your style , it’s known as Chiang Mai’s chic area with boutiques and terrific restaurants . Want to shake it a bit ??? Then it’s The Monkey Club or Warm Up . I hope you enjoy , but honestly I’m not certain what you big city girls like best . Perhaps some shopping at the brand new Maya mall or central festival .If you have never been Wat Doi Suthep is a MUST at the top of the mountain . Questions message me ….good luck and have fun !!!!! You have been to the “night bazzar” mostly for tourist . For more genuine items and better prices try the Saturday or Sunday night walking streets . These are frequented by locals and tourists alike . Saturday Chiang Mai gate , Sunday Thaprae Gate .